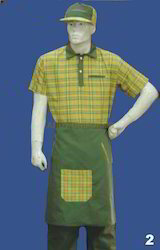 Pioneers in the industry, we offer men house keeping uniforms from India. We are one of the leading manufacturers, suppliers and wholesalers of Men House Keeping Uniforms. The offered housekeeping uniforms are specially designed for the housekeeping workforce in hotels, restaurants, and offices. Our supplied housekeeping uniforms are made from very soft and skin friendly fabric, to ensure comfort and flexibility to the wearer. The wholesaled housekeeping uniforms are available at very affordable market rates. Looking for Housekeeping Uniform ?